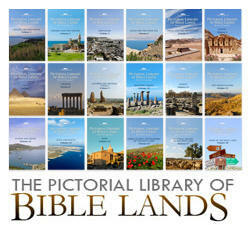 Bible students and professors might be interested in a back-to-school sale on Pictorial Library of Bible Lands. In my opinion, this Pictorial Library is the best photographic resource available for teaching and personal study of the Holy Lands as it relates to the Bible. For the next 10 days, 5 volumes are on sale for $100, including free shipping in the US. When the sale ends, the price will return to $170. To get the sale price, click here. They are also offering a $100 discount on the complete 18-volume Pictorial Library of Bible Lands or only $289. This set includes 17,500 photographs in jpg and PowerPoint format, including detailed explanations about the sites, history, and biblical significance. To get $100 off, click here.